Little Mrs. Married: well, i tried!! I tried to participate in the Girl Talk blog hop today, i really really did. I waited too late to get stuff together & ended up with a last second hurry-up-gotta-find-old-photos! It didn't work out too well. Sometime last year, i reorganized all the photos i have. But they're all just from college. And none of them have crazy clothes or crazy hairstyles. Most of the "good" pictures are at my parent's house. 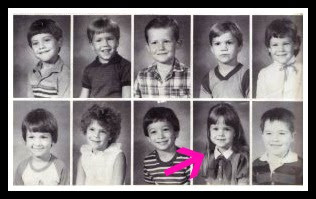 Then, i thought i'd go looking through our yearbooks, but that would just be the small class picture anyway. Wished i had some of the larger prints. But those are all at my mom's. Kindergarten = long hair with bangs. and a sailer knot thingie. 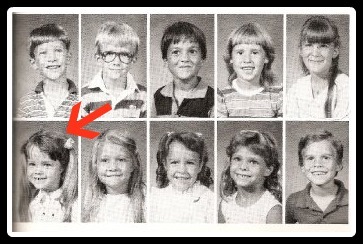 1st Grade = Long hair with bangs. Pigtails. And, man, i wish it was clearer for you. But that would be a pink hippopatomas on my outfit. Now. In 2nd Grade, we went to a different school. 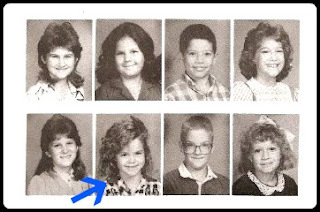 That was the year that i decided i HAD to have a perm just like my mommy's. HAD TO. I loved her curls. Well, my perm didn't turn out quite as pretty as hers! It was what i call "george washington curls". YIKES! Apparently i had mom cut the curls all off. And it looked AWFUL!! 3rd grade (above) is the chopped hair grown out a bit. Trust me. It's an improvement! And here i am in 4th. Hair much longer & in curls how i wanted them. A sidebow. Notice the girl 2 people over (Lisa) has the same hairdo. I'm pretty sure i was copying her. She was one of the cool kids. (She is in two of the other pics too). Oh yeah...the shirt i'm wearing? I remember it. It had colorful letters with an animal. Like, a panda bear sitting on the letter B. That seems a little kiddy for a 4th grader, doesn't it?! Ha! So, there ya have it! I wish wish wish i'd gotten together some stuff earlier so you could at least see some clearer pictures! One of these days, i'll show you some better/funnier pics! Check out the other Fashion Disasters at Girl Talk!! Like you, I don't have pics from my middle/high school years. Either my mom or my sister have them. I'll have to hit them up for them. It would be fun to look back. 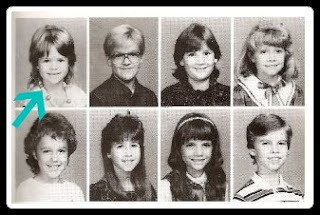 I want to see a second grade photo hahaha! A pink hippo on your shirt = awesome! And I used to wear really big hair bows. Thank God that phase is long gone hahaha. Although there is this person I see kind of regularly who is kind of stuck in the 80s and she still wears the big bows. Makes me chuckle a little bit.